Aus Safes has the latest equipment & technology to provide full comprehensive safe servicing and maintenance on safe construction and safe locking mechanisms. 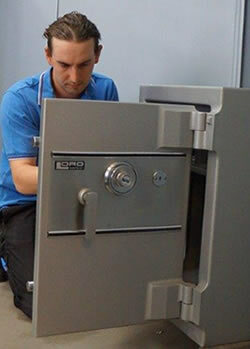 As SCEC endorsed agents and accredited security agents for major safe manufacturers such as Chubb Safes, CMI Safes, Lord Safes, Platinum Safes and Burg Wachter Safes, we provide specialised safe servicing and safe maintenance services. If you want to update your safe from key or combination locking mechanisms to digital locks we can retro fit digital code access locks to your safe. Updating to digital locks that provide additional functionality such as audit trailing, dual access and time delay functions can provide great security advantages to businesses. Aus Safes recommends a safe is serviced every 12 months to ensure they are in full operation and be able to detect faults before they arise and lock the safe out.